How far would you go for the one you love? Lie…cheat…KILL? When a woman is killed on the other side of the world, Anna Blackwell realizes that her past has caught up with her. That her greatest fear is about to come true. That it’s her turn next. I like it when a mystery/suspense/thriller is so creepy that I am still creeped out…the day after I read it. This book kept me on the edge of my seat while I was reading it. 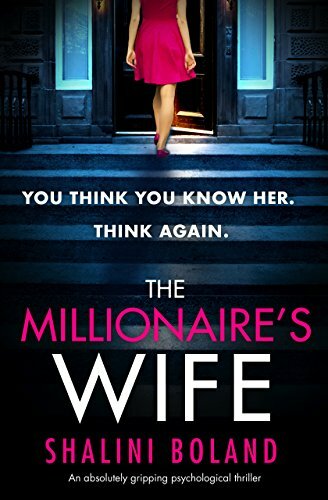 I devoured The Millionaire’s Wife and I finished it within a day. The suspense and thriller parts of the book are what sold me. From the first chapter, when Anna is getting the mysterious texts to when Fin showed up to the one twist I didn’t see coming and the twist I figured out, I couldn’t stop reading the book. What I also liked about this book, which normally I don’t like and usually complain about, was that the book went back and forth in time. The book mainly takes place in 2017 but every few chapters, the author would flashback to different times. Starting with 2005 and ending in 2014, you got a good look into Anna and Fin’s relationship. As well as her relationship with Sian and her parents. Like I said, I normally don’t like it but in this case, it worked with the book. While Anna is dealing with her present-day issues, the past Anna has a whole bunch of issues that give to her present-day problems. I did think Anna acted like an ostrich during the first couple of chapters. But honestly, if I were in her shoes, I think I would have done the same thing. Just keep everything to myself and pray that it goes away. But in her case, it didn’t go away. But that is what made the book so good. Fin was a seriously deranged dude. Even when Anna and he first got together, I could see it. And the years that they spent apart didn’t do anything but make him even more insane. If you want to know what I mean, read the book. There are two twists in the book. One that I saw coming (the way that the past scenes ended really did hint at it and it was a no-brainer when the twist became known). But the other one, well that shocked me. Talk about a character doing a 180. I couldn’t contain my shock. I was also shocked by the puppy hatred by another character. It made me sad but I can see why the author wrote it that way. The end of the book was also a bit of a surprise but I enjoyed it. It was the perfect ending to the story. Why: I really enjoyed this book. It had a great storyline, characters that I felt bad for, rooted for and that creeped out me out.